It’s always a challenge to dress the Christmas window, especially in May! (when I started). At Christmas Elves I try to showcase our amazing products whilst creating a visually interesting and inspiring space. As space inside the store is at a premium our window features many of our large scale outdoor pieces. 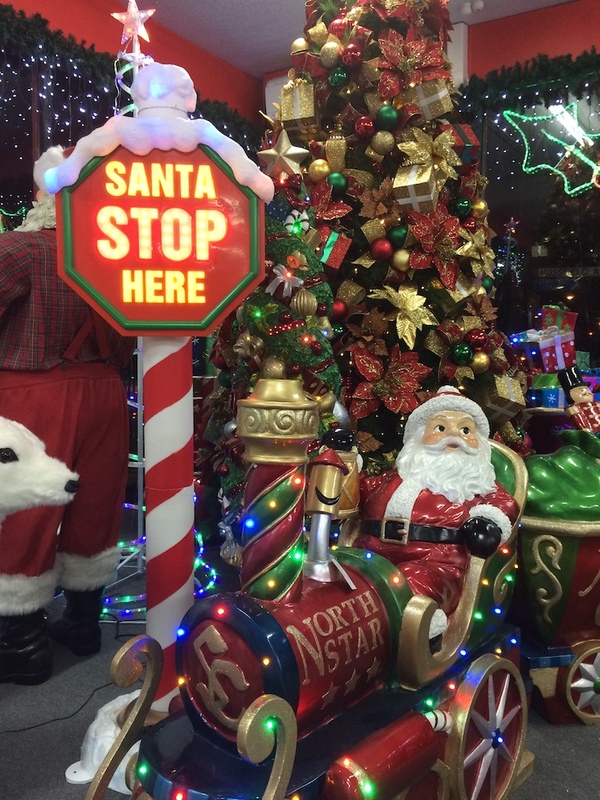 Resin figurines, lifelike animals, nutcrackers and Christmas trees have to sit side by side. With such varied product I’ve used colour to coordinate the scheme. Photo, Miss Haberdash Christmas , 2017. This year I used metallic garlands in gold and silver as a backdrop to the larger pieces, hanging them vertically from the grid above the window. The metallic discs catch the light and at night are illuminated by the lighting display. The garland also acts as a curtain, a cheap and effective solution separating the window from the shop. Our window has to work for day and night. In the evening the illuminated pieces attract lots of attention from passers by. During the day our animated lifelike animals are a real crowd pleaser. 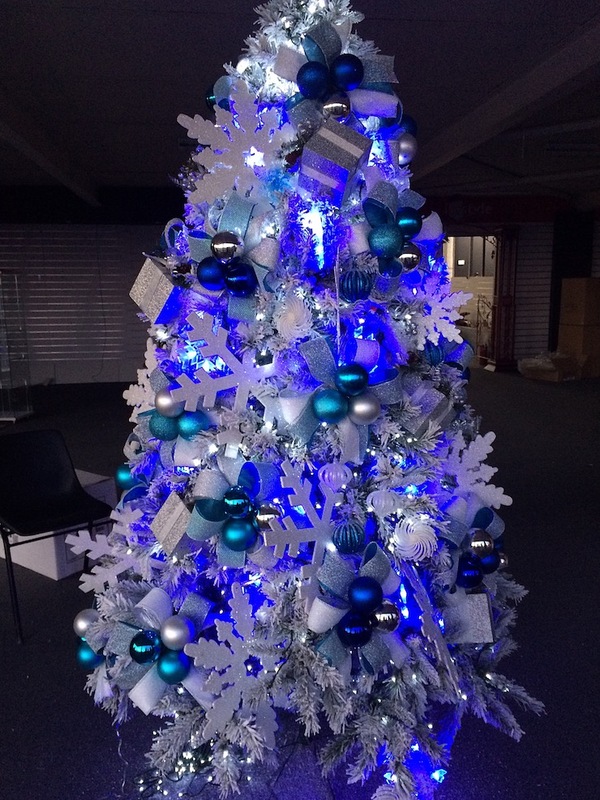 This year we also opened a second Christmas Elves store in Fern Tree Gully. This came with a huge picture window that extends along the length of the shop. The illuminated pieces make quite an impression and look great at night. 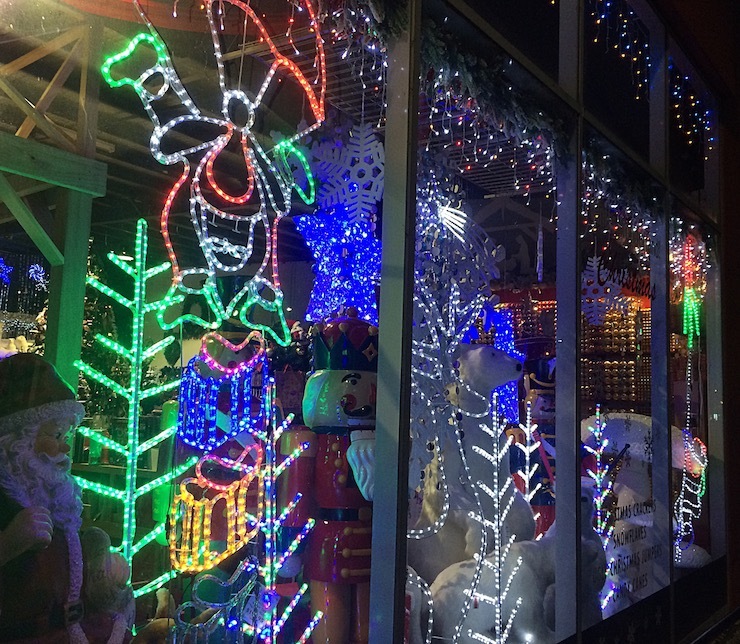 Inside the store decorated trees can be seen from both sides of the window so they feature smaller decorations, and extra lighting for night time.